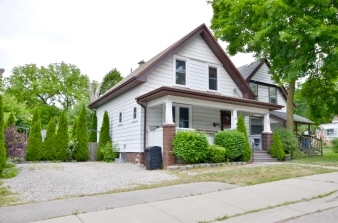 Opportunity knocks with this clean 2+2 Bedroom Duplex just minutes from downtown. Many potential options: Ideal owner occupied main and rent the upstairs, straight income from both units or easily convert to large single family residence. Main floor is highlighted with 2 Bedrooms, Kitchen including 4 appliances plus main floor Family Room warmed by gas fireplace. Upper unit consists of 2 Bedrooms, Living Room & Kitchen with door to wonderful second story wood deck. Also features many updated windows, convenient double driveway and nice side courtyard. "Estate Sale" so the property is being sold in "As Is" condition.